ALPHARETTA, GA – May 18, 2016 – AmkaiSolutions, a subsidiary of Surgical Information Systems, is a recognized industry leader in providing innovative electronic solutions to ambulatory surgery centers (ASCs)1, announced the general availability of AmkaiAnalytics 1.0. AmkaiAnalytics is a new solution that enables ASC staff to visually identify problem areas and opportunities, determine what action is needed to drive operational and financial improvements, and effectively track improvements made toward a goal. Users can also explore trends to forecast their business. 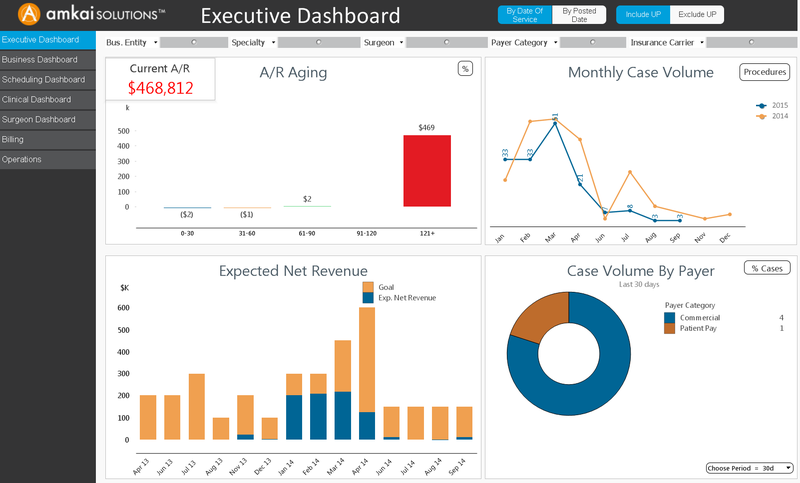 Unlike other analytics and business intelligence tools that are designed for an experienced data analyst to generate reports, AmkaiAnalytics is designed to allow end users in the organization to easily navigate the information and quickly gain insight into key performance indicators that have an impact on their roles in the ASC. AmkaiAnalytics role-based dashboards enable AmkaiSolutions clients to easily gain insight into the data that they already enter into AmkaiOffice. By drilling down into the data, ASCs are better able to manage their revenue cycle, operations, and quality initiatives. AmkaiSolutions™ is a trusted industry leader, offering innovative software solutions and services to the full spectrum of outpatient surgery providers- ambulatory surgery centers, surgical hospitals and associated practices and clinics. Our solutions help outpatient surgery facilities increase administrative and clinical efficiency and profitability, allowing them to focus on patient satisfaction. Our growing product line includes AmkaiCharts, the leading EMR in the outpatient industry and AmkaiOffice, a next-generation management software solution designed to replace and enhance the “legacy” systems in use today. The AmkaiSolutions team’s extensive experience in the outpatient surgery industry positions us well to bring substantial new streamlining and added benefits to the market. AmkaiSolutions is a subsidiary of Surgical Information Systems. For more information visit www.amkai.com.